ChemLaunch™ is a powerful, robust and secure solution that enables Agilent's OpenLB ChemStation™ families of products to be controlled in a client-server environment. ChemLaunch™ eliminates the need for dedicated PCs located adjacent to each Agilent analytical instrument. The Agilent ChemStation/ChemStore/MassHunter/OpenLAB ECM instrument management capability that is traditionally provided by a local dedicated PC can now be provided by a centrally located ChemLaunch server. The server, running Citrix, VMware Horizon and/or Microsoft Remote Desktop Services (Terminal Server), can be accessed securely from any approved location worldwide. 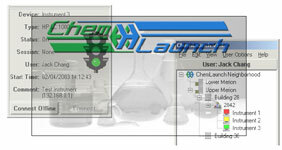 ChemLaunch™ provides significant cost savings and efficiency gains for the operations of analytical labs.